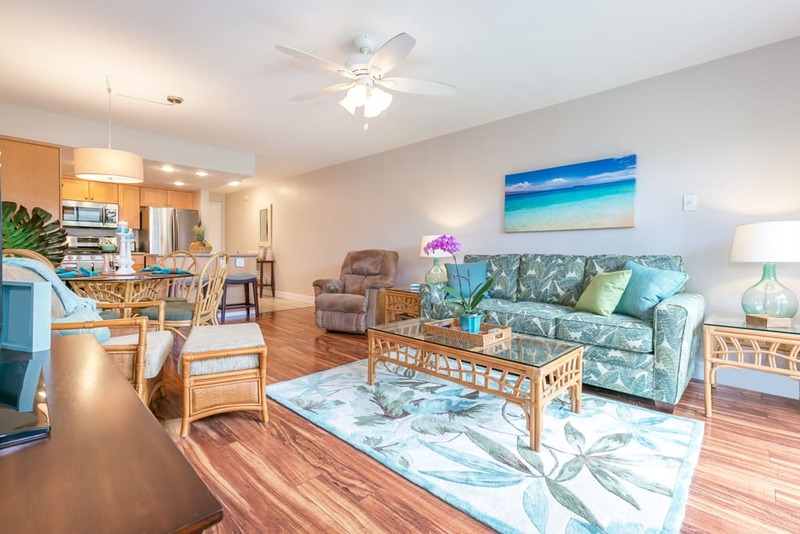 Charming beach condo just waiting for you to arrive! Open living area, brand new renovations. New Pergo floors, paint, furniture, stainless appliances. New furniture, lighting, floors, paint etc. 8.5" Pillowtop mattress. Super comfy! View through to the garden and lanai. 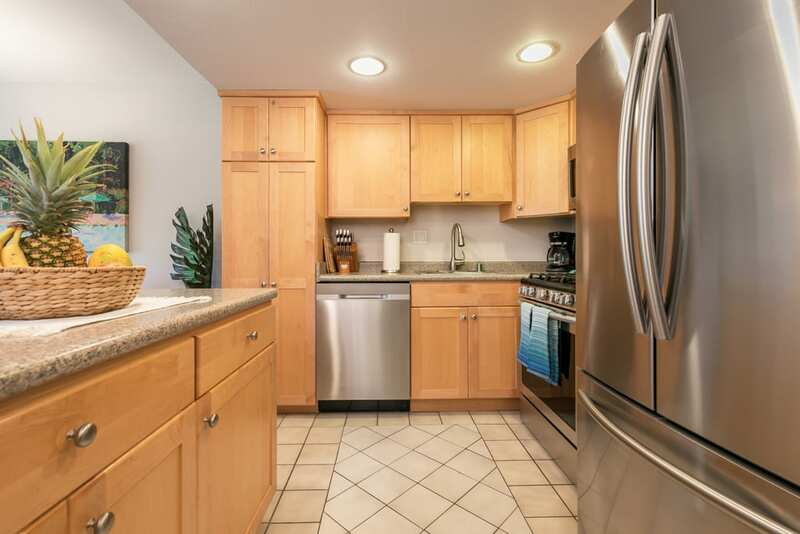 Brand new stainless appliances, cooking gear and gadgets. 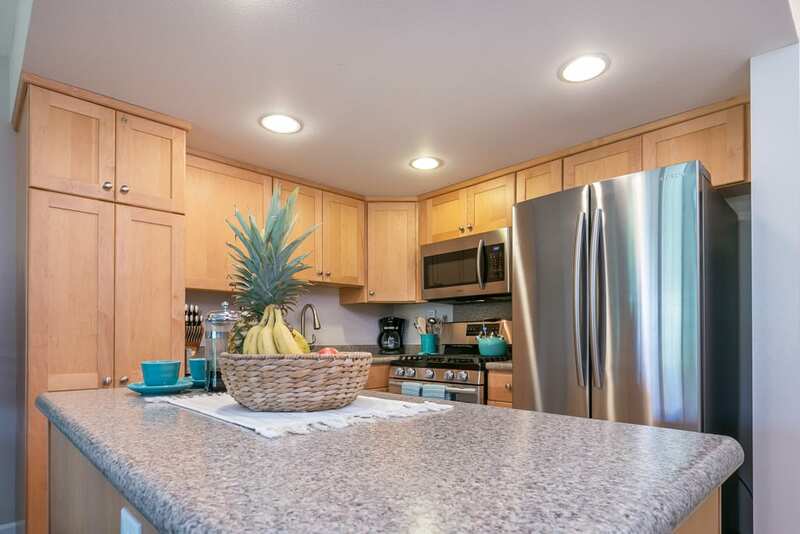 Make island fruit smoothies in the fully outfitted kitchen. Soothing island colors. Queen bed with memory foam topper. High privacy windows allow for island cross breezes. All beach gear available in the closet. 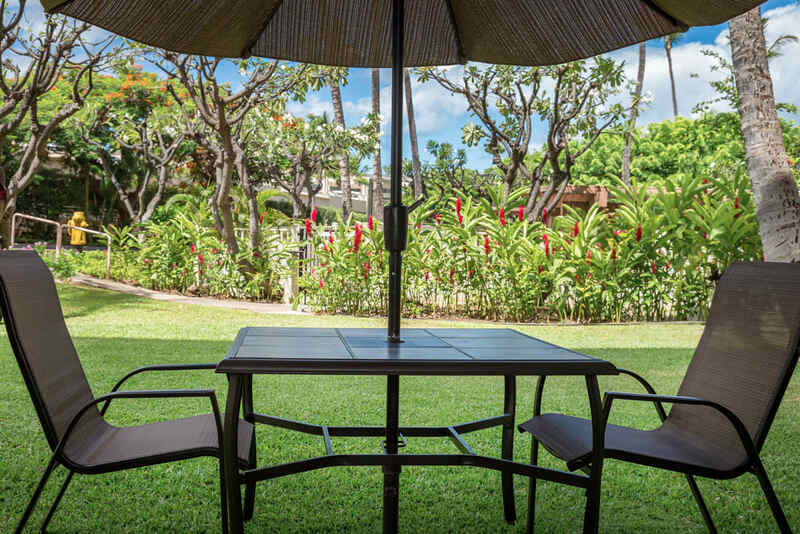 Our garden lanai with table, chairs and umbrella. Start your day having your coffee with the island birds. Cocktails on the lanai! Just steps to the pool. 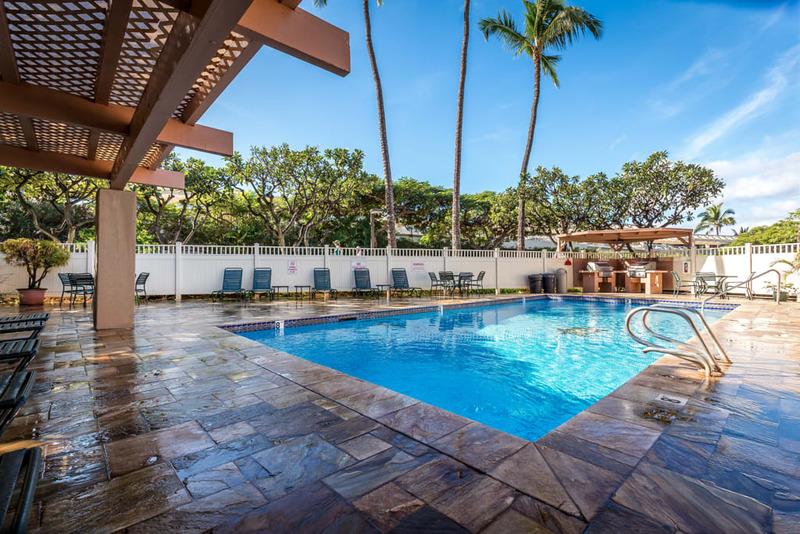 'Our' pool, just mere steps from the lanai. Second pool with community area, book lending library, showers, bath, prep kitchen, Free WIFI. 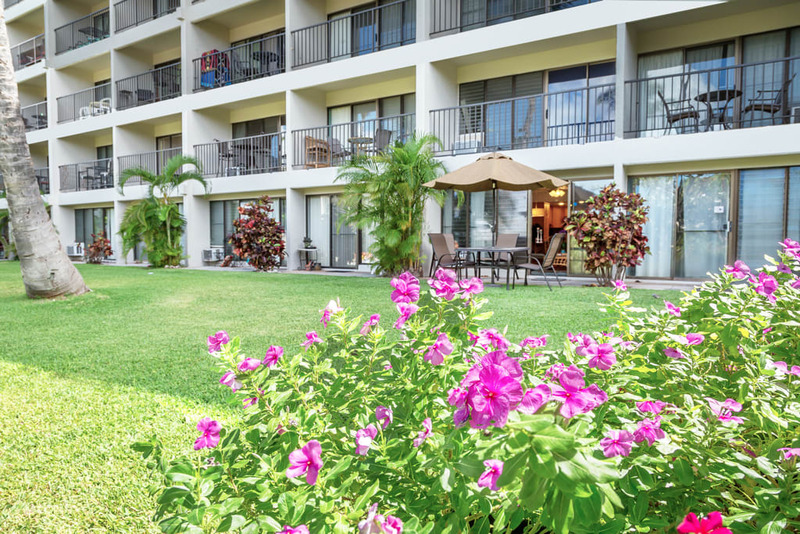 We're located directly across from Kamaole II beach! 3 min. walk from our door. 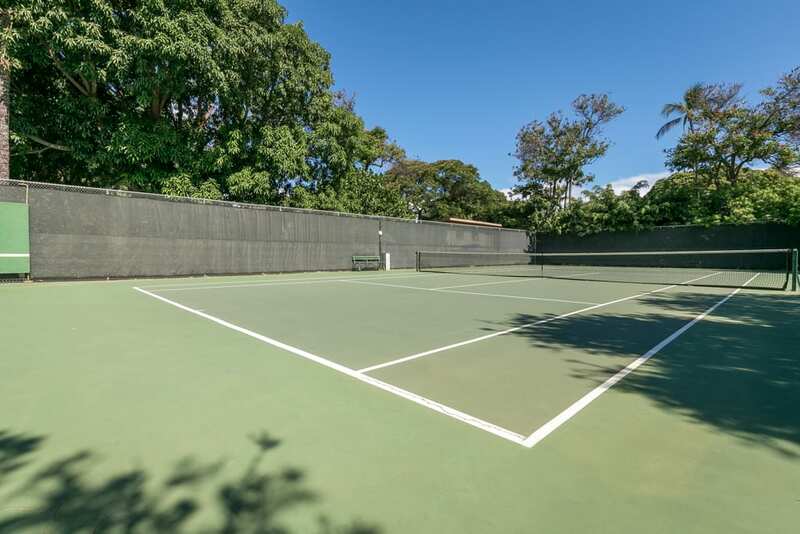 Private tennis court with available equipment rental. 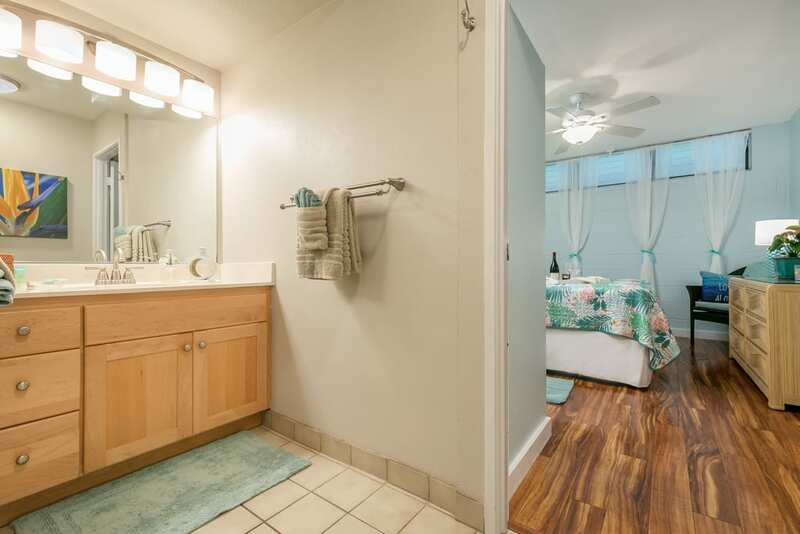 Directly across from Kamaole Beaches! Coveted ground-floor condo with walk-out garden lanai. 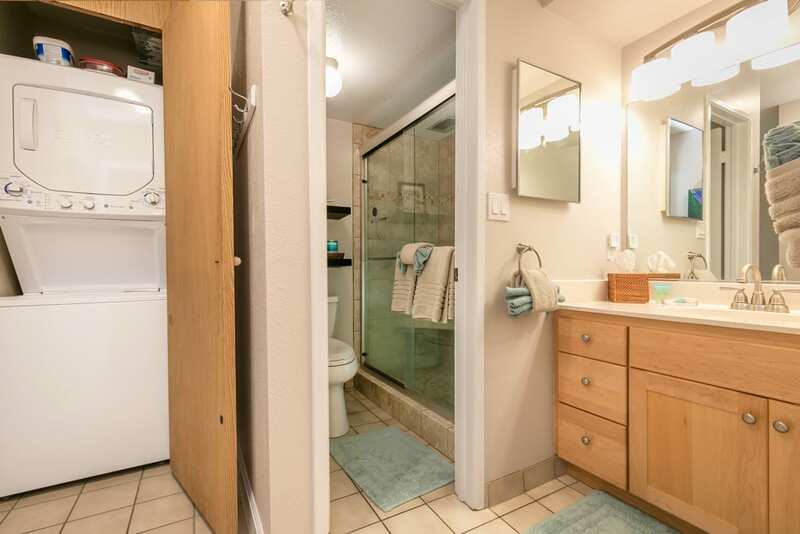 1 bedroom/1bath with brand new renovations. New Pergo floors, paint, furniture, stainless appliances. 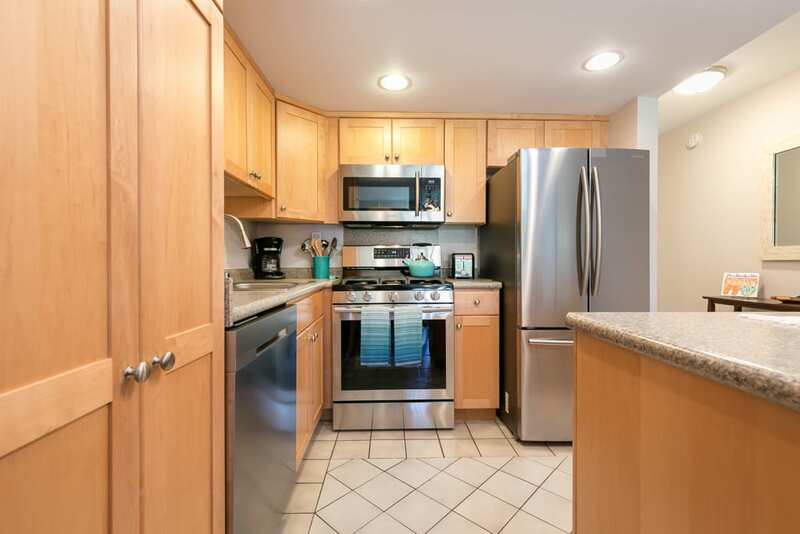 Fully outfitted kitchen with every imaginable gadget, sharp kitchen knives, MagicBullet for island fruit smoothies, Cuisinart, French Press coffee pot. Queen bed in master with new 8.5" pillow top mattress in pull-out sofa-bed. 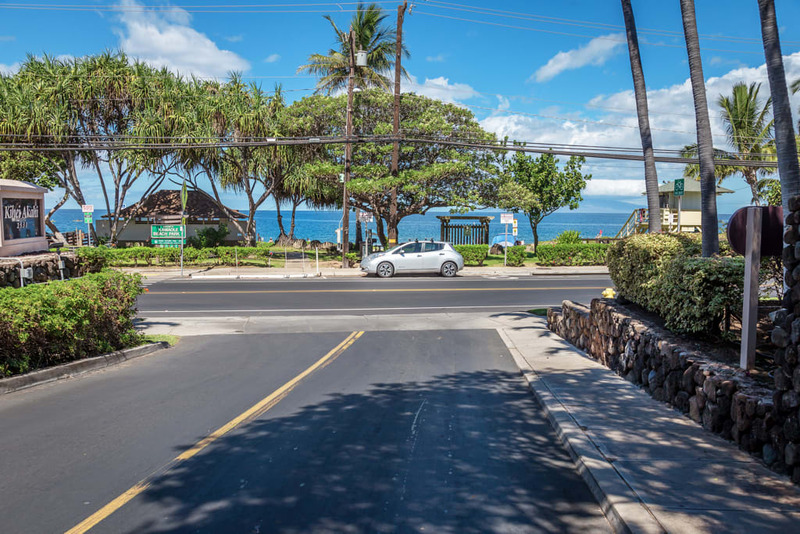 Located directly across from Kamaole II beach, 5 min walk to many restaurants, pubs, shopping, groceries, activity warehouses, convenience store and more. Our condo is just mere steps to the private gated pool. Complex boasts two pools, tennis, on-site private security. We offer complementary highest speed available WIFI, Roku, SmartTV, HD Cable, Bluetooth stereo, USB charging stations. Free calls to Canada, Mainland and 32 other countries. A/C unit in living room with ceiling fans and portable fans. Ensuite washer and dryer available. Free parking for primary guest. Well behaved children welcome. Condo is NOT childproofed. Maximum occupancy is 4 people including infants and children. This is a NON-SMOKING/NO TOBACCO condo. Our family had an incredible vacation at Jeff and Laurie’s Maui condo. The cleanest, most comfortable, most stylish and most well equipped codo we have ever stayed at in Maui. 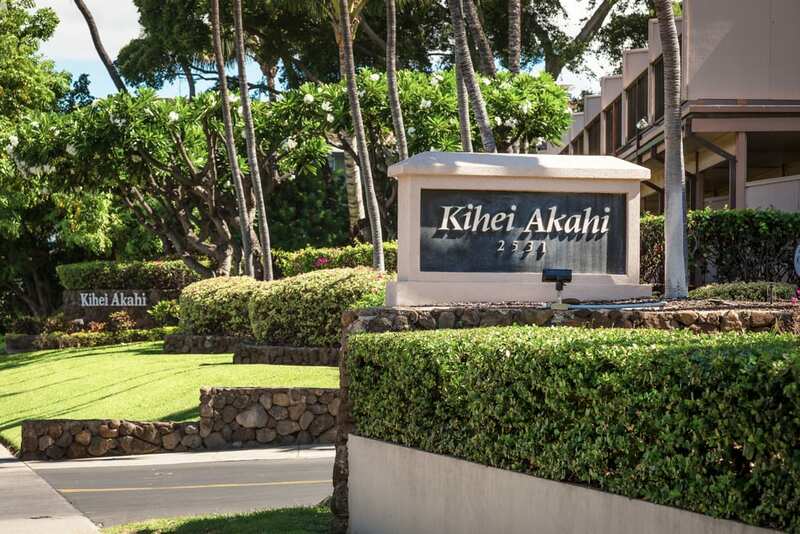 Exceptional location in Kihei and within the complex. Ground level entry right by the pool is great! The communication, attention to detail and organization provided by the hosts is amazing. 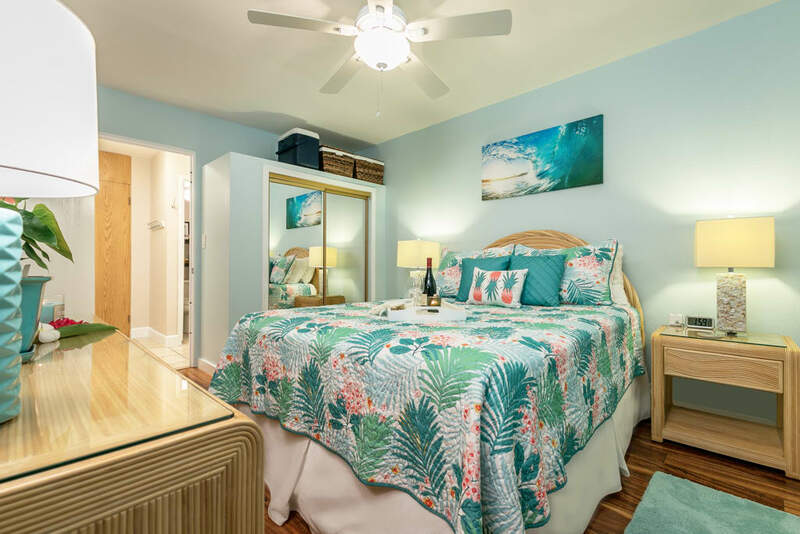 The condo has beach towels, beach chairs, beach umbrella, beach wagon, sand free beach mat, boogie boards, coolers…..anything and everything you need for your days at the beach. Oh and don’t forget the decor coordinating water bottles 🙂 The welcome basket and card put a smile on our faces when we arrived after a long day of travel. Will definitely be back! We were celebrating our 40th wedding anniversary, Laurie and Jeff’s condo was a great place to start. The condo had everything we needed, very clean and comfortable. 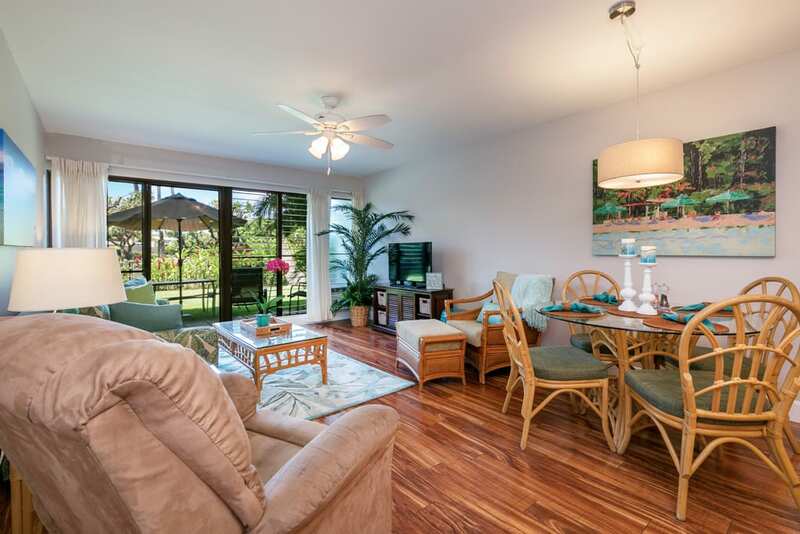 Great lanai, steps from the pool and a short walk to Kamaole II. The weather was sunny everyday and we had some very yummy huli huli chicken to munch on. 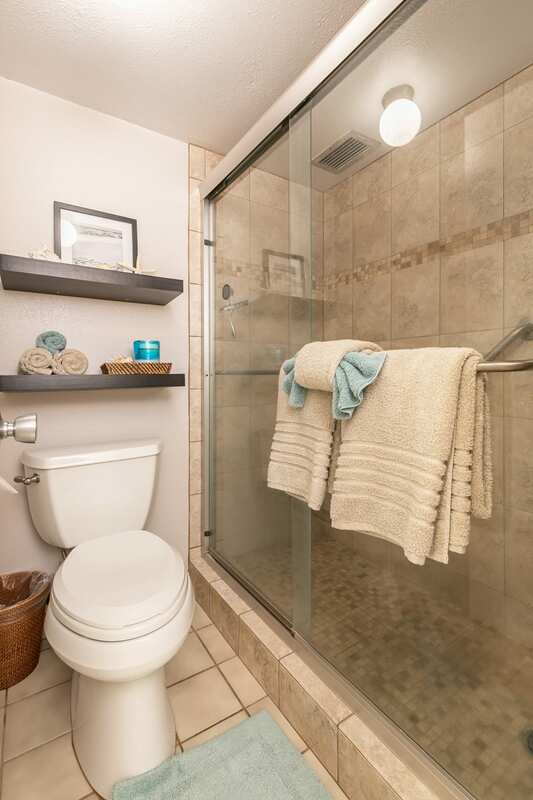 We would most definitely recommend this condo to all our friends and relatives. Mahalo to Laurie and Jeff for sharing their lovely home with us. We were so happy when we checked into the condo. It was so clean and comfortable. We instantly felt at home. The nice basket of goodies was just the right touch. Loved that we could walk to the beach, shops and restaurants. We had come from Oahu with lots of traffic and congestion. Maui was such a different atmosphere, it really felt like a vacation. We will definitely stay there again. Amazingly close to the beach! Laurie is the nicest host I have ever had. She was very helpful and responded quickly when we needed her. The property was amazingly close to the beach. The property is also very well equipped. We wanted to give it 10 out of 5 if we could. Thanks Laurie for everything. We just finished a 3 week stay in Laurie and Jeff’s condo in Kihei. 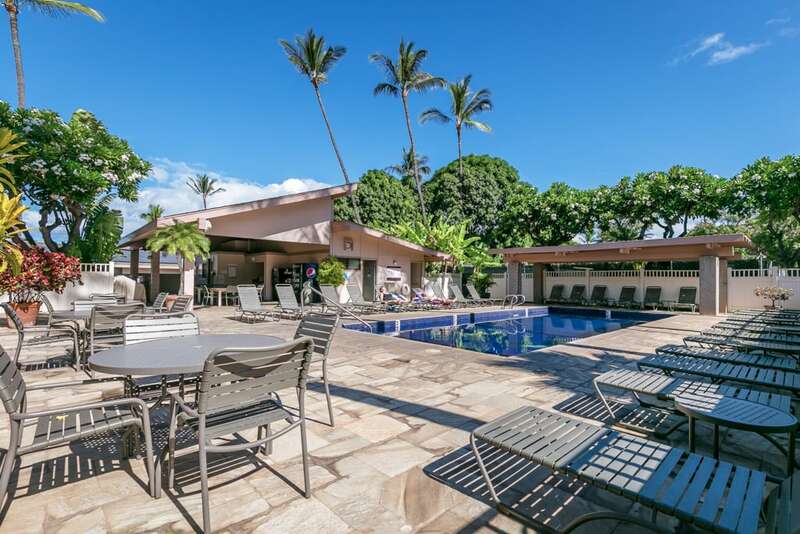 The location is perfect, across the street from Kamaole II beach – one of the largest and nicest beaches in Maui. They have all the beach equipment you need, great chairs, umbrella, sand free mat, large cooler and ice packs, beach towels, noodles, boogie boards and a nice wheel rolling cart to carry all to the beach. The kitchen has wonderful appliances and well stocked – being there for work for 3 weeks we cooked in most nights and had everything we needed. Laurie was wonderful to work with, answered my questions, with quick response time. NO problems at all with payments, deposit refunds, etc. The unit is ground floor, so nice to walk right out on the grass and the pool is directly across from their unit. Very close. The walk to the beach is easy, but note that coming back to the unit, it’s a slight uphill. No big deal. My only issue with our stay is that the bedroom does not have its own air-conditioner and the air flow through the unit was not enough to cool off the bedroom. Note: we were there in August, and it was a heat wave, exceptionally warm according to the locals. We had every fan going (nice that they did have many extra fans in the unit – so that helped.) The location was walkable to restaurants and shops and beach, and only a few blocks from the highway, so easy to get around the island. Parking place is right under a tree, so kept the car cool. It was our great pleasure to host you and your family. 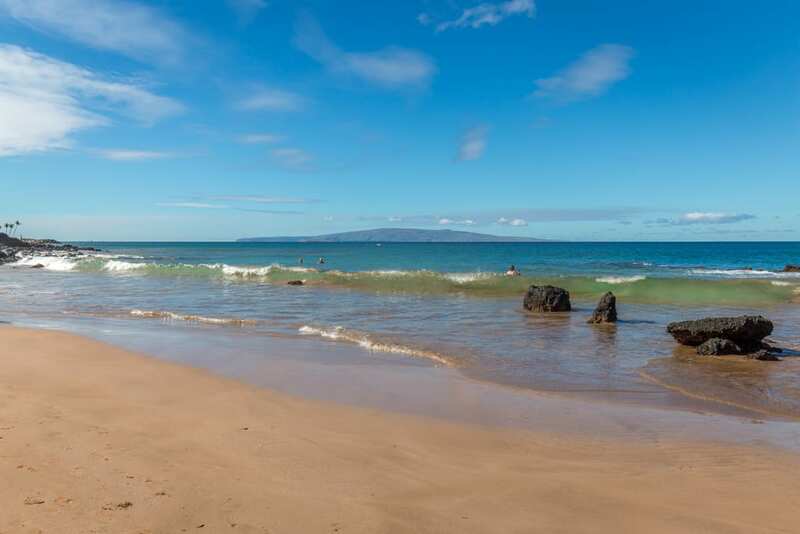 We're thrilled that you had such a wonderful vacation in Maui and we welcome you back any time! 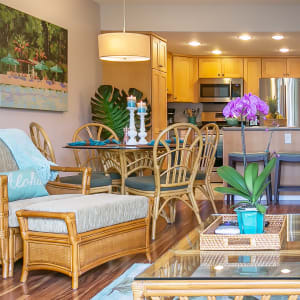 What a fabulous condo Laurie and Jeff provide for your Maui island stay! As the saying goes, location, location, location! 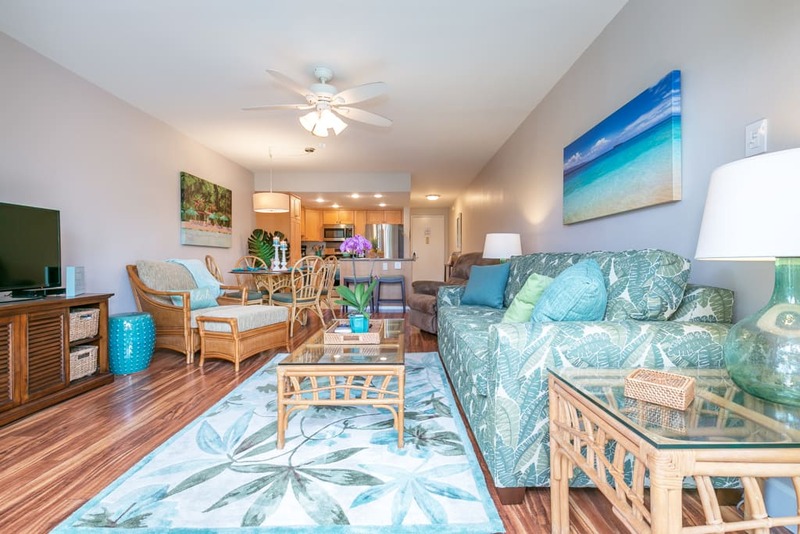 Not only does this condo provide you a luxuriously furnished place, it offers serenity and calm moments to soak up the aloha spirit in the morning breezes or sunset vibrant colors each evening. You will not be disappointed whatsoever! In fact, you’ll begin planning for a return visit before you leave. Laurie and Jeff are amazing owners and truly deliver 5-star service from beginning to end. 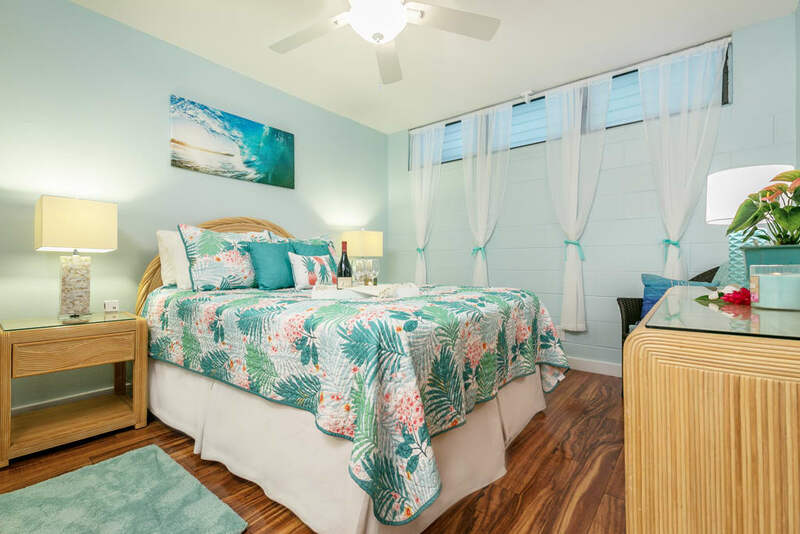 You will find yourself in an island paradise location with one of two pools just steps away and one of several beaches a walk down the condo complex driveway. 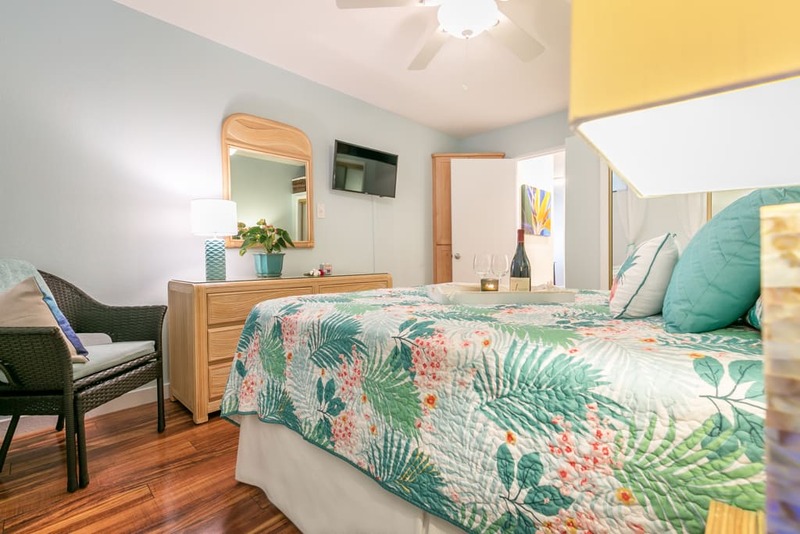 Laurie and Jeff have furnished this home with everything you can think of for your vacation needs (from beach gear, kitchen needs, bath/BR linens, electronic connections, etc). 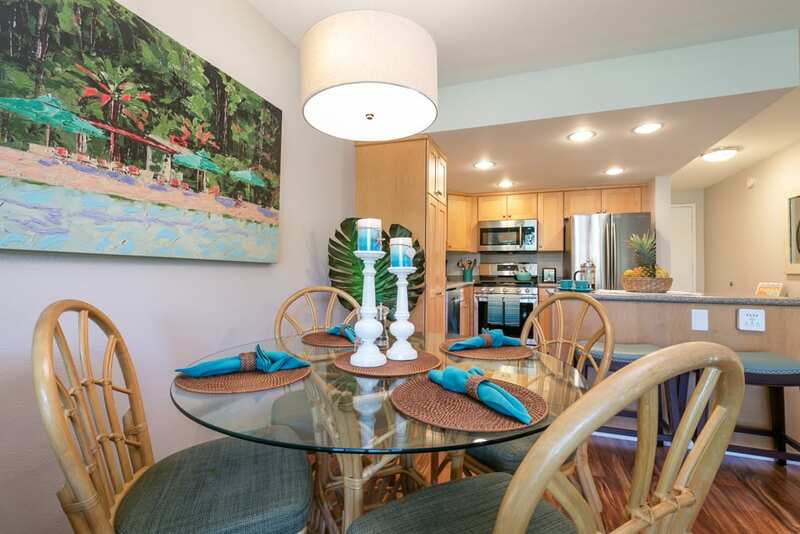 You can cook your own meals or explore the many wonderful restaurants within walking distance of a short drive away. Don’t forget to get your local Shave Ice treat too! You can immerse yourself in the many various island activities (snorkeling, paddle boarding, fishing, beach walking, swimming, mountain biking adventures on Mt. Haleakala as well trips to Lahaina, Upcountry and/or taking a cruise to Hana and exploring the waterfalls and delightful swimming spots along the way. OR, you can do everything that brings you rest, relaxation and rejuvenation of the body/spirit/soul. 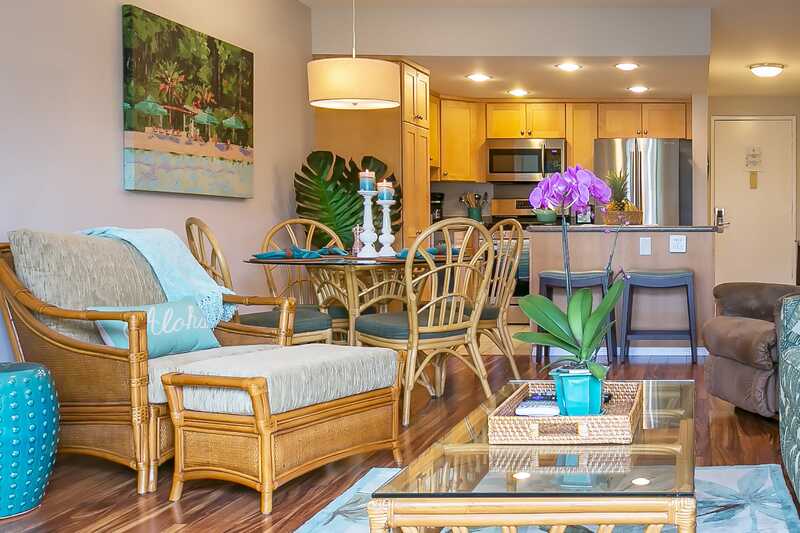 Enjoy the patio while listening to the soft songs of the island birds while breathing in the sweet scent of the plumeria tree or sit by the pool that’s just steps away or languish under a palm tree/umbrella on the beaches that are a short stroll from this condo. 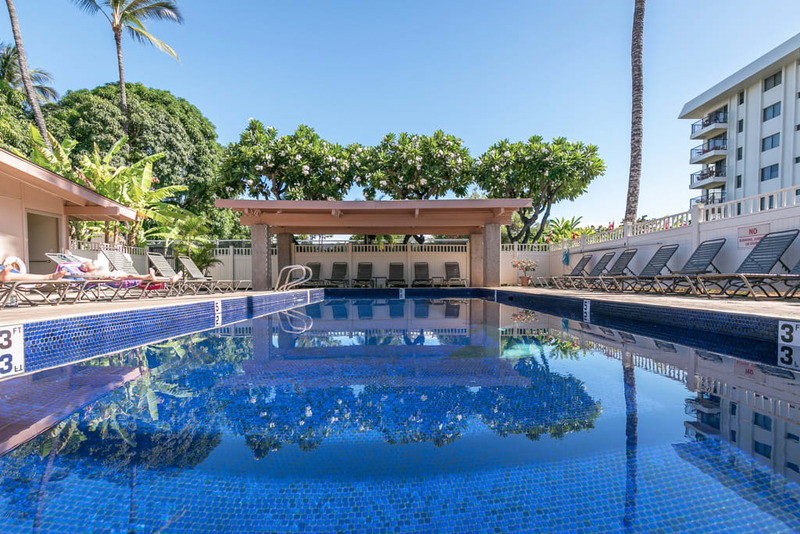 Give yourself and your family/friends the most enjoyable and memorable vacation at Kihei Hale O Maluhia. 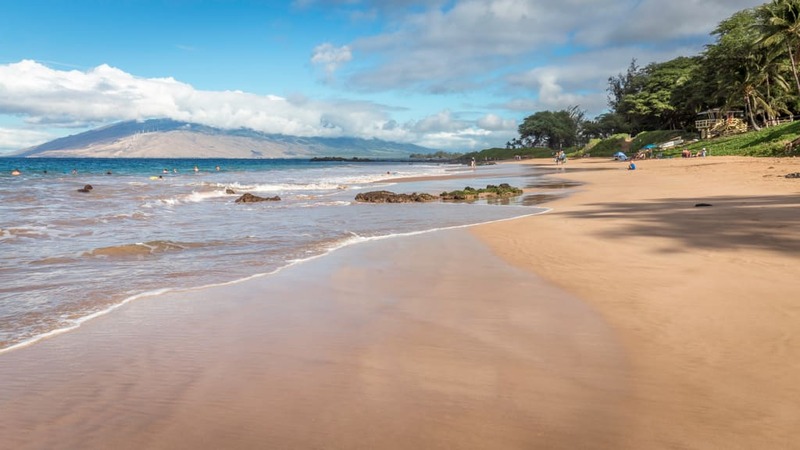 You’ll be on Maui time and living in the island spirit before you know it! Aloha! We really enjoyed our stay at your beautiful condo. The colour scheme is relaxing and comfortable. We loved that we could come and go from the lanai and relax out there after returning from the beach. The kitchen had everything you could possibly need and the beach gear was very handy. We especially enjoyed the boogie boards. Jeff and Laurie were very helpful and made the booking process easy. Thanks for making our break from reality a reality. We loved the charming condo which felt like it reflected the owners’ style. It definitely did not feel like a hotel! More than enough space for us and our 1-year old baby. We tucked the crib alongside the baby in the bedroom. Overall the complex was quiet, and the other guests were friendly. 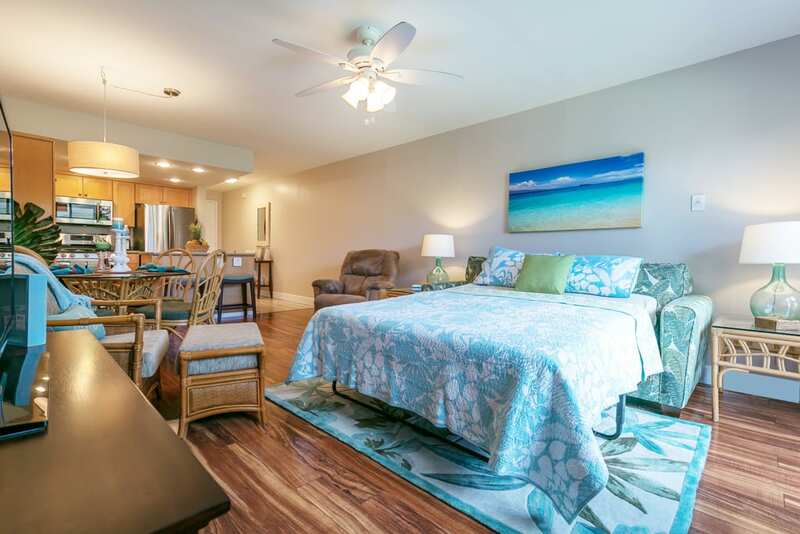 The condo was conveniently located with restaurants, groceries, and beaches within walking distance. Laurie was very responsive to all of our questions and gave us great tips for things to do. We especially enjoyed Palauea Beach – went on a weekday and it felt like our own private beach! Having the beach gear (sandmat, chairs, cooler, boogie boards, etc.) available at the condo made life easy. We enjoyed our stay at Jeff & Laurie’s and would consider staying here again. Mahalo! What a delight to find this slice of heaven. Careful thought and consideration went into every detail of this homes design with guests comfort in mind. We found everything we needed and beyond for a memorable stay. Quiet, clean and dare I say luxurious. Stop searching and book! 5 stars! Yes, it’s a five star experience..! It’s really comfortable, clean and beautiful home. 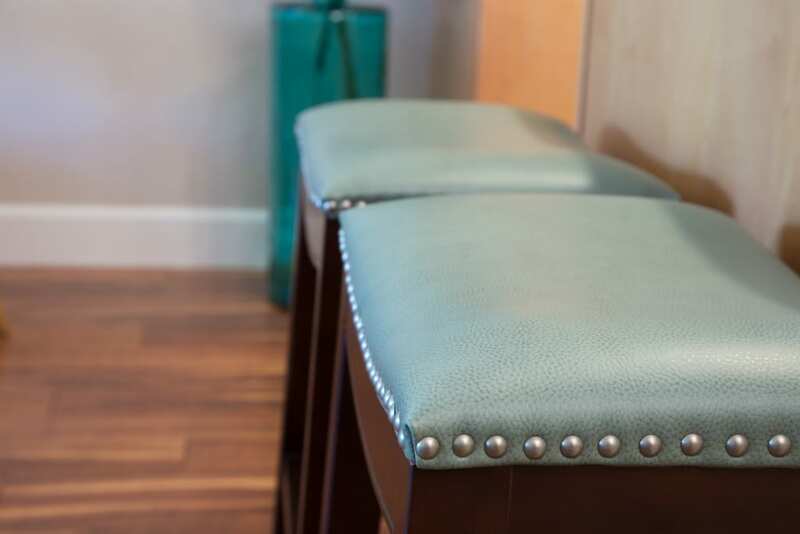 It has everything you might need for a great vacation and even more… You’re feeling like someone always cares about you. Every day we had a possibility to enjoy a pleasant and warm morning in front of the door on a beautiful lawn with a cup of coffee. The place is quiet and secure. An amazing beach is right across the street. Highly recommended! 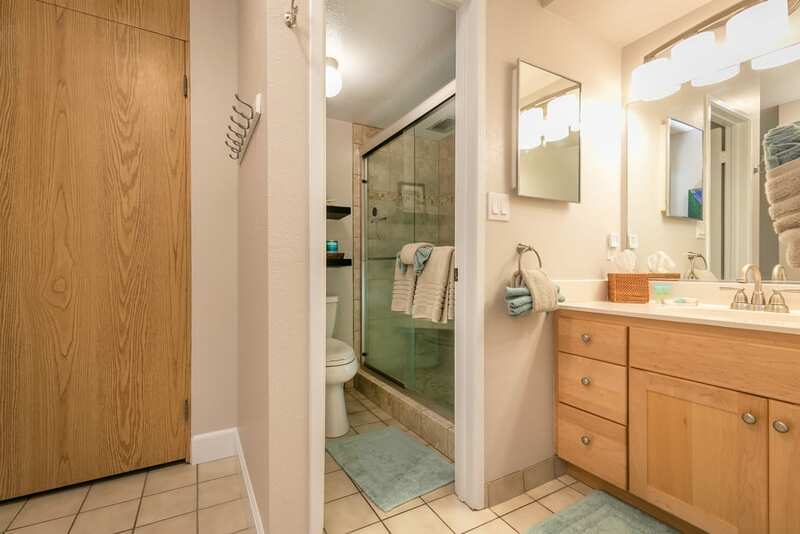 A lovingly decorated and outfitted condo, don’t hesitate if this is the right location for you. 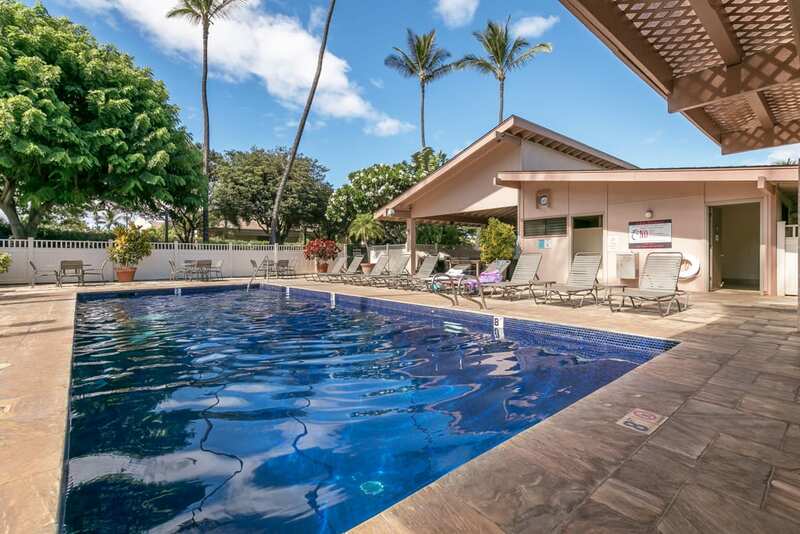 Steps from a fantastic beach, fresh cinnamon rolls, about 1km to surfing (lessons rentals etc) and some of the best value restaurants in the area (Paia Fish Market and try Nalu’s also). 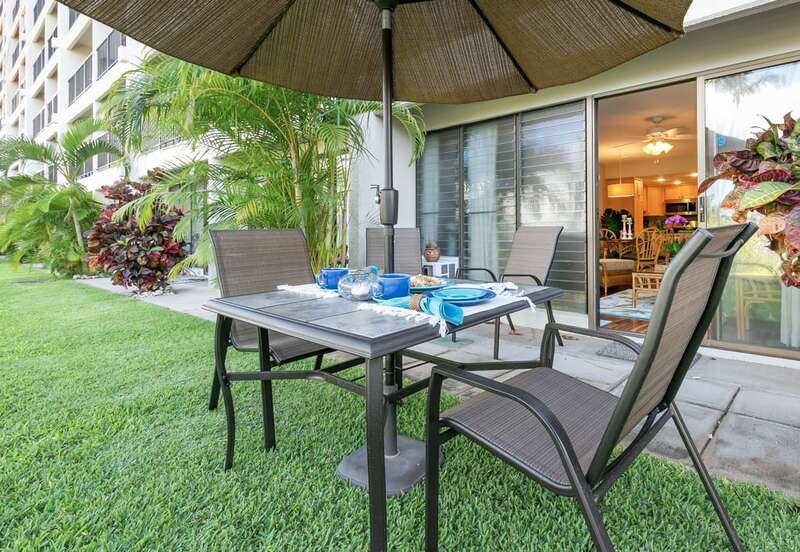 We are active and hit the entire island from this centrally located condo. As such, we almost felt bad not utilizing what was available right there! Many thanks for a great experience and lovely stay!! What a wonderful surprise when we opened the doors to this great condo. From the perfectly outfitted kitchen to the sunny garden patio to gorgeous bedroom, it was more than we expected. The pool was right out the back door and the beach was only a short walk away. There were also beach chairs, an umbrella, a cooler, and a wagon to get it all transported easily. We were definitely the envy of the beach goers!! There was nothing we were lacking. We can’t wait to go back. Thank you so much. 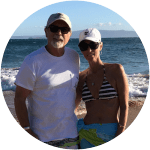 Aloha, we are Laurie and Jeff Bounsall and we are the owners of unit DG13 at Kihei Akahi. We love Maui and are so grateful to have our second home on the island. 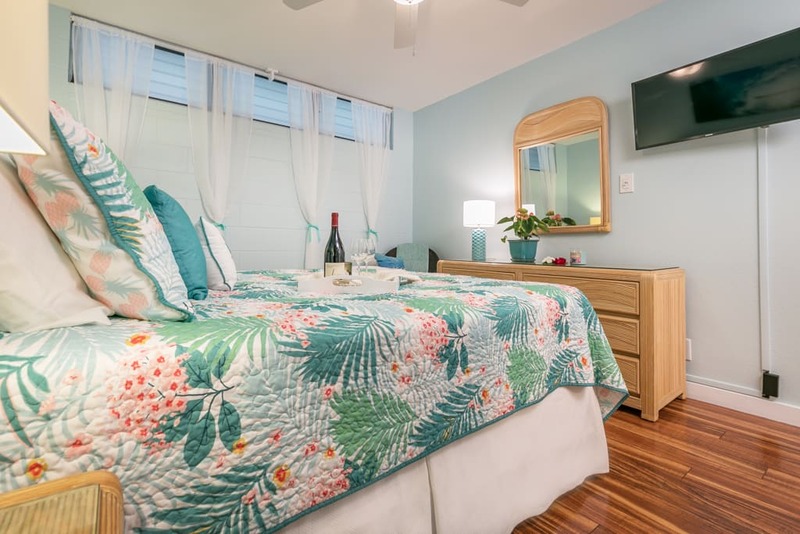 We’ve worked hard to provide a wonderful vacation home for you to enjoy. We welcome you to Contact Us with any questions. 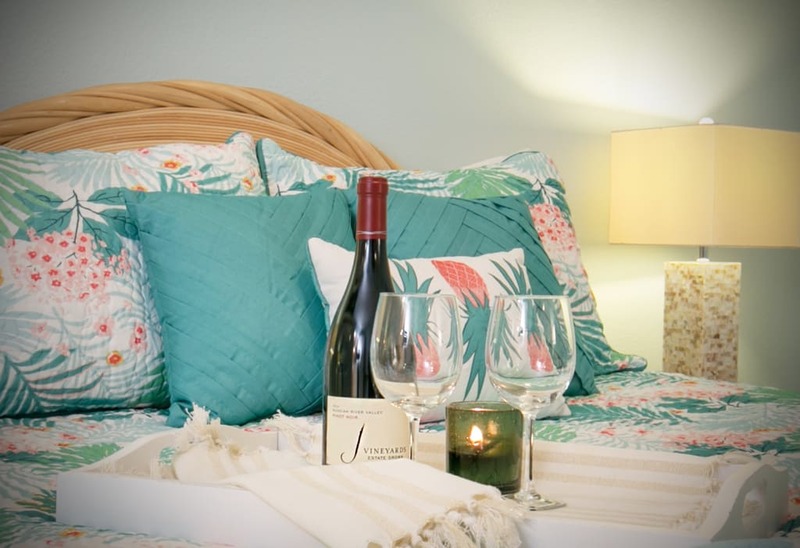 Or have a look at our Rates and Availability If you prefer, or if you are ready to make a reservation, you are welcome to call or text us between 9AM and 9PM Pacific Standard Time at 1.707.341.0802.